Posted by Teresa Mihelic HelpDesk on Saturday, June 16th, 2012 at 8:04pm. Looking for a great place to watch this year's display of Fireworks around Orange County? We came up with our top 5 places, and a description of where and when to watch them. Feel free to post your comments, they are always welcomed! San Clemente: the city of San Clemente does it display of Fireworks at the Pier. At approximately 9:00 p.m. the City continues its annual tradition with a spectacular fireworks display from the Municipal Pier. Admission is free. Fisherman's on the Pier also hosts a beautiful banquet, but reservations are required way in advance, as this is their busiest event. Our experience in the past has been that you have to get there early - people start gathering at the Pier Beach ( the two sides) since early in the morning, and the place gets pretty packed around 5pm. Prepare to walk as parking gets hard and in most cases, you'll end up parking in one of the side streets above the Pier. Bring blankets! 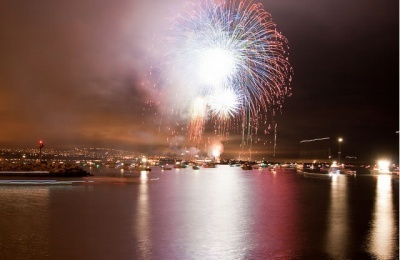 Dana Point: the display of fireworks here is done right outside the Harbor, and begins at 9:00pm. The perfect place here to watch the show is at Doheny Beach. Get there early,as this is the busiest day of the year! Doheny’s day-use opens at 6:00 am. Doheny closes a 10:00 pm. Due to the geography of Dana Point, there's many many places where the fireworks can be seen from - a couple of our favorites are at Lantern Bay Park ( right in front of the Marriott), Heritage Park, or at Pines Park. If you are one of the lucky residents with a boat, then you know where to go, but there's also cruises you can book to view the fireworks from the Harbor. At the parks, in most cases, not only will you see the Dana Point Fireworks, but will see the ones from San Clemente to the distance and the San Juan ones on the back. San Juan Capistrano: the events at this city are hosted at the Sports Park located off Camino del Avion. Festivities include mechanical rides, bounce houses, activities for the kids, food, exhibits, and a beer garden, there is no cost to enter the park, tickets for rides and bounce houses may be purchased on site. The evening culminates with a spectacular fireworks show designed and choreographed by Bay Fireworks. Parking can be done on the street, and some additional parking in the sports park complex. Laguna Niguel: The Laguna Niguel Regional Park hosts a display of special fireworks right over the lake. Families and friends gather at night here to enjoy this beautiful display, that starts at 9pm. Mission Viejo: the city hosts a yearly event called 'Annual Street Faire' on Olympiad Road and in the area adjoining Lake Mission Viejo. Rides, games, booths for food for purchase, drinks, crafts, gifts and games can be found everywhere. There's live music, dance and comedy for the whole family, with local and other performers. The event ends with the display of fireworks at 9:00pm.